Is the new British Airways catering a big lie? 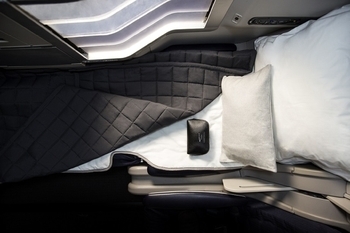 Is BA’s new Club World catering essentially a big con? If you are flying to London from Hong Kong in Club World today, you will have received the ‘new’ Club World meal service for the first time. This was, as you may remember from the glossy British Airways launch event last year, to be provided by Austrian group Do&Co. 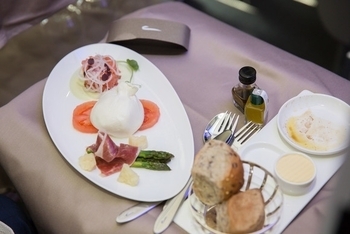 Do&Co is the gold standard of airline catering, and is the reason why Austrian Airlines business class has such an outstanding reputation for its food. The new Club World meal service is being added to additional routes as the weeks go on. Whilst I had heard a few reports about poor quality, it wasn’t clear to me why. A crew member on Flyertalk has now spilled the beans. Apart from New York JFK, the food is generally unchanged. Apart from New York JFK and the odd outstation, the primary food provider remains Gate Gourmet and not Do&Co. “The same food arranged differently on new china” is how the crew member describes it. It is worth noting that this poster is a respected and long-serving member of Flyertalk. He also feels let down, because even cabin crew did not have this explained to them during the training process. They were also expecting to be serving food of the New York JFK standard on other routes. He also claims that the amount of food loaded has also been decreased in recent weeks as a % of passengers booked, so there is less chance of being able to have the first choice of food. Now, the more cynical among you may not be surprised by these ‘allegations’. (Are they ‘allegations’ really? It is a statement of fact that Gate Gourmet remains the food supplier and there is little sense that much has improved in terms of quality.) However, with all the talk of “£400m investment” (a sum now increased to £600m) you would have expected something to be delivered. It seems not. Another cabin crew member I contacted has confirmed the story. That person did feel that there had been a little improvement over what Gate Gourmet was previously providing but that the JFK route food used in all of the PR is far superior. I also heard an interesting story about why Club Europe catering is being changed again. I would like further corroboration on this before I write about it, so if you work for BA and know what I am talking about then drop me an email just to reassure me. ‘Seven’ is the magic word I believe …. The roll-out of the new The White Company bedding is continuing, albeit at a snails pace. From 21st February, it will be available on: Atlanta, Dubai, Hong Kong, Washington, Houston, Kuwait, Los Angeles, Johannesburg, Philadelphia, Riyadh, San Diego, Seattle, San Francisco and San Jose. We flew CE to Barcelona on Saturday. Had the ‘afternoon tea’ service. The cake was inedible and sandwich fingers dry and curled up. We had nearly reached the Pyrenees when they finally served us drinks (in row 10). When collecting the trays back up I noticed that almost all the food remained on trays. When will BA get the message? The trick with afternoon tea service is to order a special meal! You can’t order special meals short haul. I did.. but on a different flight! We were in fact offloaded from our original flight (to LPA) after our son had a nosebleed as we taxied.. and BA refused to fly us until he had been ‘incident free’ for 2 hours. So after a brief visit from a paramedic, we spent 6 hours in various Heathrow lounges before travelling onto LPA via BCN. ‘Booking flights isn’t a version of ‘Let’s Make a Deal’ – it’s take it or leave it.’ @JAXBA In some quarters bartering is still alive. you can barter with an airline? really? which airline is offering “Buy now or Best Offer” ? Are the new CW amenity bags available yet or is it still the big blue shoe bags? We got them on flights to Vancouver in January. Though I prefer the old ones! The new ones don’t have much spare space in them to store my glasses for example. Available to NYC in November last year. OT But BA – Have just rung the GGL line to book some flights to Australia for Christmas. I’m clearly not the only GGL trying to burn an Amex 2-for-1 plus GUF2 + force extra seats with a Joker, because on my first choice flights LHR-SIN and SIN-SYD too many GGLs had already done that! Ended up having to do LHR-SIN a day earlier than planned, and SIN-SYD a day later. Still, Sydney return at Christmas for ~200k avios + £1300 in a mix of J and F for 2 (so £650+100k each effectively) isn’t bad. OT but catering, last week I flew BA Club LHR to HKG and Cathay business HKG to AKL and ordered the special low lactose meal on both flights. What a contrast! BA don’t even provide a non-dairy milk/creamer for tea and coffee and their tea is too strong to drink without milk. Both their starter and main were seafood – prawns to start and a white fish as main – which I am not keen on, ate 2 of the prawns and after a couple of bites gave up on the fish, as it was dry and horrible. It came with a few veggies and some kind of fake-cream sauce. The dessert was a weird cold rice pudding concoction with strawberry in a chocolate cup and sauce that was frankly undercooked – the rice was hard in places. Breakfast was pretty standard, just without the cheese in the omelette – even BA can’t get breakfast too badly wrong. Cathay’s special meal was much better. The starter was a turkey salad with sweet corn, the main was also a white fish (honestly, can’t they at least tell us what’s in our meals? We get handed the same fancy menu as everyone else but have no idea what we’re getting until it turns up in front of us), and my heart sank when it turned up, but it was actually properly delicious, even for someone who is not keen on seafood, and I cleaned my plate. Dessert some fruit. And breakfast was steak and mash! BA have a long way to go to compete with Cathay. OT. My wife just came back first class(Avios redemption). One case came over an hour late after everyone received theirs. It was also soaking wet but no major damage, inconvenience. As she traveled First could she get compensated for such a long wait and having to deal with a wet bag? And who to complain to? Is this a thing? Suitcases are often wet depending upon the airport and whether it is raining, aren’t they? the priority is getting your luggage put on to the plane first….which means it comes off last ! A few years ago when I flew with Malaysian booked via ba website I complained when I was made to wait an age for my bag despite me flying in business. From memory my complaint to BA didn’t go far but eventually they relented and gave me 10,000 Avios. So it was worth persisting! Well I’ve just come back from my return journey from LHR to Abu Dhabi, which just came short of 2000 pounds WTP ticket. From Abu Dhabi to LHR. I arrived at Terminal 1 and was told that BA checkin does not open till 11:00pm, 3 hrs before the flight boards. No BA staff present. This information came from Eithad staff. It was 9:00pm so I had 2 hours to kill. Eventually the checkin opened and I headed straight to the business lounge, (as it was my first time here) I proceeded to Eithad’s Premium Lounge , only to be told, sorry you’re in the wrong lounge and pointed me in the right direction. I was immediately informed at the reception, again non BA staff; maximum stay 3 hours and as the flight was leaving in this 3 hour window I wouldn’t need to be ‘turfed out’ , in case I was over the 3hrs. I don’t know if any of you have visited this lounge, suffice to say it’s more like a 70’s school hall waiting room with the chairs to match! “British Airways adds three new lounges ” – I think they need to sort out their existing lounges before opening up new ones. My first trip to Abu Dhabi with BA and I’ve learned the hard way parting with all that cash! Rest assured I WON’T be making that mistake twice ! I suppose over half term they charge £2k for WTP. To be fair in a sale they are doing Abu Dhabi in Club World for £1399 these days and indirect business class, eg Lufthansa via FRA, can be even less. I nearly paid cash for October half term because it was only £1399 to Dubai in CW in the last sale but uncertainty over my wifes work commitments meant that miles seemed more sensible. British Airways new DO&CO catering is such a wonderful improvement.Of course Gate Gourmet is crap you can’t compare these two wholly different choices.Look at the new Club World breakfast on BA117 Lhr-Jfk fab breakfast by DO&CO .And whinging about BA and that you can fly on better Business class on other airlines.This completely untrue. You think you’ll get a better service/meals on Virgin/Delta/United or Continental/KLM or any other European airline the answer is emphatically NO YOU WON’T .British Airways are investing to improve. We only fly BA First/Club World or Club Europe it’s the only way to fly.British Airways exclusive First Wing check in/Concorde Room lounge just fantastic.